Instead, I'm writing because the juxtaposition of Batman Begins (spoiler alert) with the Sermon on the Mount has been provoking some thoughts lately. As you may know, the driving theme of Batman Begins is Bruce's wrestling with his deep seated desire for revenge against the man who killed his parents. This anger is transfered to 'evildoers' in general and it is only gradually that he comes to realize that "Justice is different than revenge." And that would seem to be a fitting moral to the story, but the movie climaxes with a scene setting the parameters on the requirements of justice. With the villain at Batman's mercy, prodding Batman to finish him off, Bruce responds in what is apparently meant to be a witty and self-evident moral conclusion: "I'm not going to kill you, but I don't have to save you!" Immediately after this statement he abandons the villain as the train careens into a building, resulting in his inevitable end. Thus is the climax of the first edition of the latest Batman story. Then there is Jesus, who in the climactic scene of his story is simultaneously at the mercy of his persecutors while secretly restraining his own perogative to bring down heavenly armies to wipe out his enemies. As he hangs on the cross, before breathing his last breath, he reveals his guiding morality: "Forgive them, Father, for they know not what they do." Fulfilling his own teaching to love your enemies Jesus' life flies in the face of the common sense that characterized the morality of his day which bears a striking resemblance to Batman's moral code. "You have heard it said 'You shall love your neighbor and hate your enemies.' But I say to you, love your enemies and pray for those who persecute you." Jesus wouldn't be satisfied with Batman's morality. Neither can followers of Jesus content themselves with merely doing no harm to 'evildoers'. We must love them. If we imagine Jesus in Batman's place as the train approached the building with his enemy at his mercy and insisting on his own death perhaps he would say "I'm not going to kill you--I'm going to save you!" I'm watching with interest how Batman's moral code will serve him in the Dark Knight. We already know how Jesus' served him through his dark night--it ended with a bright Easter morning. Your thoughts continue to provoke me. Who exactly are you? You sound like you should be in a line up with Brian McLaren. Please keep writing. Susan -- sorry if I spoiled it for you, but this movie (Batman Begins) came out years ago! I haven't spoiled The Dark Knight yet, but I just might, so beware! 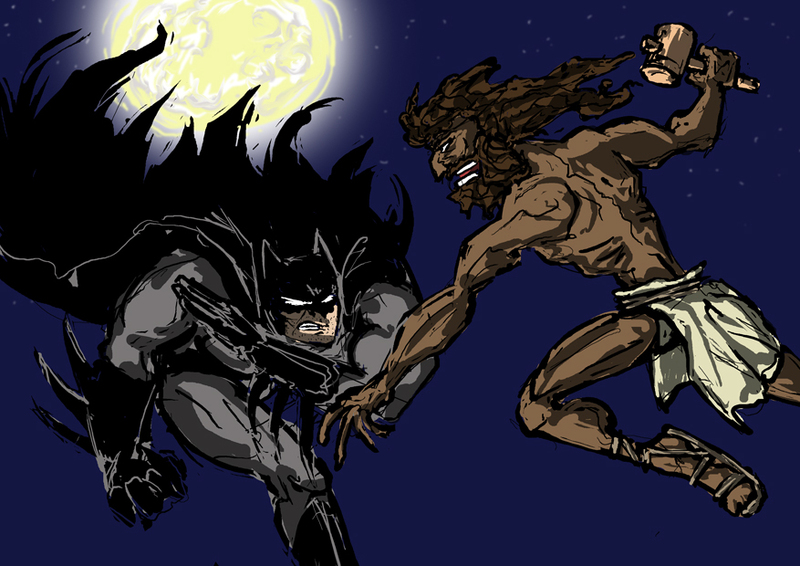 Clearly Batman would win, First fight batman wins Jesus dies,Since Jesus died, all sins forgiven. Then 40 days Later Jesus runs away to his daddy in the sky after preaching how he says it happened. Then he never returns.